Welcome to Part 1 of "DC Direct schools Mattel," a continuing comparison of the ways in which even a company new to the world of toys can outpace the industry's old guard by making good decisions. Despite DC Direct's insistence that they don't want to compete with Mattel's new line of DC figures, some overlap was sure to happen eventually. "Eventually" actually turned out to be "almost immediately," just as Mattel's new Batman line was hitting store shelves with its terrible selection of unsellable figures. One of the few worthy figures in that initial stage was Batman's nemesis, the Joker. As you can tell from that review, the figure, while still being better than half the line, was fairly disappointing: undersized, under-articulated and under-decorated, the Joker just had problems. Days after the Mattel line began arriving in stores nationwide, DC Direct shipped its Batgirl/Joker two-pack and showed fans what Mattel should have given them. The Joker's past is shrouded in mystery and rumor... but his actions are nothing short of a nightmare! The self-styled Clown Prince of Crime first encountered Batman during a botched robbery at the Ace Chemical Factory. Escaping by leaping into a drainage vat of chemical waste, his skin turned white, his hair turned flourescent green... and his mind turned to insanity! 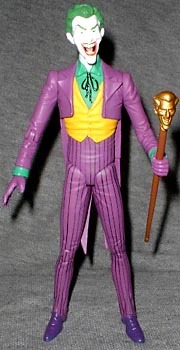 DC Direct's Joker is everything that Mattel's wasn't: he stands 7" tall, the right height to loom over Batman and his underlings as well as the pathetically undersized Mattel Joker; the sculpt isn't as dynamic as what the Four Horsemen gave Mattel, but it shouldn't be - this is supposed to represent a specific comicbook version of the Joker, and it does just that. He's wearing his iconic purple suit, orange vest and green shirt, though he's got the purple gloves that Mattel ignored. Like Mattel, DC Direct molded their Joker's head from white plastic and painted details on. In their case, that strategy works. As stated in our Exclusive Silver Age Batman review, a Four Horsemen sculpt needs a paint wash to bring out the detail - neither Joker got it, but DC Direct's is simple enough that he didn't need it. Rather than an ugly pseudo-gun that fires silly projectiles, Joker only comes with his "joker's head" cane. While Mattel gave us a similar accessory, DC Direct produced it in plastic that is sturdy enough not to bend. Though there's no excuse for DC Direct figures to cost so much when they offer so little in the way of articulation and extras, they're still giving us more than Mattel. DC's Joker moves at the neck, shoulders, elbows, wrists, hips and knees. Though a waist would have been nice, the elbows really show how sad and pathetic Mattel is for their fear of articulation. Batgirl is Barbara Gordon, daughter of Gotham City police commissioner James Gordon, who first became Batgirl to save her father from criminals. But the library sciences major found she possessed a talent for the job and over time became a trusted ally of Batman. Just as I bought the Birds of Prey set mainly for Oracle, I got this set for the Batgirl figure. Though techincally a "Silver Age" Batgirl, the only thing that sets her apart from her modern incarnation is the big red purse, and even that's easy enough to ignore or remove. 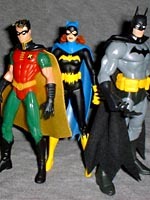 Wearing her black uniform with yellow boots and a blue cape, Batgirl stands 6" tall, putting her relatively in scale with Mattel's Batfamily. Though the hair poking out the back of her mask keeps her head from moving very far, she is articulated at the neck, shoulders, elbows, glove tops, hips and knees, a pretty standard selection for DC Direct. Batgirl comes with a "special climbing Batrope," which amounts to an odd, large handle on the end of a string attached to a suction cup. Still, it's better than what Mattel would give us with a similar figure. This series of Silver Age two-packs all have the same base: one corner of a brick building's rooftop, measuring 8" by 5 1/4" and standing 3/4" tall. The base is triangular, so you can combine the bases into one rectangular piece. The first set in this series included Silver Age versions of Batman and Robin, while the next is slated to include Catwoman and the Penguin. It would be nice to see this series comtinue, perhaps with Two-Face and Commissioner Gordon; although with four sets, the rooftops would no longer fit together. At that point, it would be tremendously cool if DC Direct released a figure-scale Batsignal that fit in the center of the existing bases to create the roof of Police Headquarters. Why is Mattel so pathetic? Tell us on our message board, The Loafing Lounge.